This month's theme is tanks! We look at both modelling and gaming with tanks, including pitting different rulesets against each other to see which provide the best 'treadhead' experience. 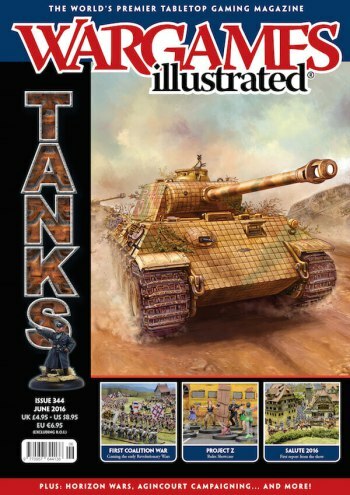 We also have our regular features and a variety of non-theme articles for those of you who are not motorvated by mechanised wargaming. We kick off our theme content with a look at some of the great and the more obscure tank battles from the pages of history. Part one of a two parter on collecting armies for the early French Revolutionary War, circa the War of the First Coalition. The Battlefront Studio introduce us to their new entry level tank combat game. So you want to wargame Agincourt but you don’t want to collect an army of several thousand figures per side? Not to worry, our editor looks at using the Perry Miniatures plastic French and English Agincourt box sets to wargame some smaller actions of the Agincourt camapign. We take the same forces and use the same basic scenario to try out two different sets of rules designed to simulate big tank battles during World War Two. The designer of the new Zombie Apocalypse game from Warlord Games takes us on a road-test of the rules. Two treadheads sit down at a table with 16 different tank kits in front of them and wade through the lot, looking at the pros and cons of the different models. Our roundup of all the action from the largest wargames show in the world. Includes a look at the best games and what was new from the different manufacturers. Captain Kitbash joins the team to provide some insights into getting better, more realistic versions of your Allied armour onto the tabletop. Robey Jenkins, author of the new 6mm sci-fi rules from Osprey, tells us about the design philosophy behind the game. The third in our series of articles, we have another great scenario from River Horse for Terminator Genysis: The Miniatures Game based upon events from the movie. Nick Buxey shows us how to apply rust effects to our models. In this extended Club Focus Aramiha Harwood takes us on a tour of a collective of clubs from Melbourne, down under.